The editor of a campaigning Chinese newspaper supplement has denounced the authorities' decision to shut it down. In an open letter circulated on the internet, Li Datong said he did not know whether to laugh or cry. The publication, Freezing Point or Bingdian, was well-known for its investigative reporting and analysis. 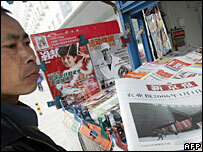 The move is the latest of several interventions against Chinese media. The editor of the progressive Beijing News was recently removed from his job. "When one does not have the truth, one is afraid of debates; when one does not have the truth, one is afraid of openness," Mr Li wrote in the letter. "They [the Central Propaganda Department] are so disgusting that I don't know whether to cry or laugh," he said. He said Freezing Point, a supplement of The China Youth Daily, had incurred the wrath of the government on several occasions over the last few months. Articles the authorities had objected to included one on Taiwan's developments entitled The Taiwan that you may not know and a tribute to the reformist ex-Party leader Hu Yaobang, whose death sparked the Tiananmen Square protests. Mr Li told the BBC's Chinese Service that the excuse the authorities gave for shutting down the supplement was the publication of an article on 11 January by Yuan Weishi, a professor at Zhongshan University, on the way history is taught in China. Mr Yuan wrote that Chinese text books never acknowledge the culpability of the government, but blame others instead. "We were raised on wolf's milk," he wrote in the article, meaning a culture of hatred and violence. The Beijing News, whose senior editors were sacked late last year, had also reported on sensitive topics, including incidents of rural unrest.